Traditional performance management systems consume an enormous amount of an organization's time and money. Based on various estimates, the cost of lost time due to traditional performance evaluations ranges from $2.4 million to $35 million per year for companies with 10,000 employees. And yet the evidence is clear --the impact of these review programs has been dismal. What's more, many of these review processes have been found to actually hurt organizations rather than help. According to Gallup analytics, only 14% of employees strongly agree that the performance reviews they receive inspire them to improve. For leaders, this is not merely a question about your front line -- it's about how you develop future managers and leaders. Failing to develop leaders is the single most expensive mistake a leader can make. With that in mind, Gallup took a comprehensive look at the current state of performance management -- including interviews with top scientists, leaders, managers, meta-analyses involving hundreds of studies, and using its own database of more than 60 million employees. 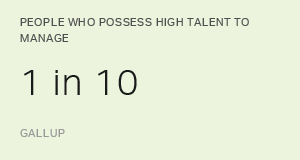 Gallup's research suggests this: Today's top talent does not want a boss, they want a coach. "Performance management" must be transformed into "performance development" -- an approach that focuses on growing leaders, not just keeping employees accountable. All other conversations -- about new scoring methods or digital tools -- should be grounded in this new developmental, future-oriented mindset. 1. Establish expectations: According to Gallup analytics, only 50% of employees clearly know what is expected of them at work. And only 41% strongly agree that their official job description aligns well with the work they do. Even more troubling, a mere 26% of employees strongly agree that their manager is good at helping them set work priorities. To be effective, managers need to become very skilled in setting expectations that are clear, collaborative and aligned. That means managers need to be involved, themselves, and involve their employees in the process of setting expectations. The worst thing you can have is an employee or manager who tells you, "Yes," but does not believe the goal can be achieved. When employees believe a goal is unreachable, they tune out. At their best, goals are challenging but attainable. During a review, leaders and managers should share the top priorities they would like employees to accomplish. They should also allow employees to share their own objectives -- what they will accomplish, when it will be done, and how success will be measured. According to Gallup analytics, only 30% of employees strongly agree that their boss involves them in setting their goals at work. Those who do strongly agree are 3.6 times more likely to be engaged. This point cannot be overstated: When your managers and employees are included in setting their goals, they are more likely to be engaged, more likely to believe their goals are fair, and more motivated to achieve those goals. 2. Continually coach: The typical employee today receives minimal feedback from their boss. According to Gallup, 28% of employees say they receive feedback a few times a year, while 19% say they receive feedback once a year or less. This means that meaningful, ongoing feedback is nonexistent for nearly half of American employees. The solution is to provide performance conversations that are frequent, focused and future-oriented. At a minimum, leaders should provide meaningful feedback to their direct reports every week and provide substantial developmental coaching each month. The mutually agreed on goals form the basis for these ongoing coaching conversations. Ongoing conversations provide an opportunity to adjust goals as business changes, rather than delay adjustments until formal progress reviews, when it is often too late. They also provide an opportunity to build confidence in times of crisis. In 2009, the hotel industry in North America dropped 25% in revenue, due to perceived corporate excess during the financial crisis. In situations like that, you must give your people something to keep them working hard -- because they will need to work even harder to get you out of the hole. During regular conversations, negative issues should be addressed and success should be recognized and praised. Not only do frequent honest conversations keep employees and managers accountable -- they also improve perceptions of fairness. If feedback only happens during an annual evaluation, employees and managers have no opportunity to fix mistakes, make things right and learn. Additionally, when ongoing performance conversations occur, annual reviews hold no surprises. A coach must understand the strengths and weaknesses of his or her team and position each person so they can each reach their highest potential for the greater good. Leaders who trust their employees and managers with autonomy create confident leaders who feel empowered to make decisions. 3. Create accountability: Given that traditional management has been perceived as more "boss" than "coach," you might assume managers have been effective in delegating and holding employees accountable. But less than half of employees (40%) strongly agree that their boss holds them accountable for their performance goals. To be meaningful, accountability needs to be achievement-oriented, fair and accurate, and developmental. When people think of accountability, it is nearly always in the negative sense. Performance evaluations typically have the aura of judgment with a particular focus on fixing problems. An achievement-oriented review reframes the conversation around future performance, continuous improvement and recognition of excellent work. Similarly, developmental conversations focus on identifying natural talents and growing them into strengths. One additional benefit of a coaching mindset is that it reminds you that you are preparing your people for something else. You have people under your charge, to develop and grow, and someday you will hand them off to others. Mentoring others to become the best version of themselves gives work meaning that ultimately translates into higher performance and successful future leadership. The ultimate goal of re-engineering performance management for your managers is to drive employee performance to increasingly higher levels of excellence -- so that they can lead your organization for decades to come. In practice, this is the difference between "satisfying" employees and building a culture of "ownership." When managers are invited to take ownership of their own evaluations and goals, and when they feel their boss truly cares about them and their performance, high performance results. As Charles Schwab famously said, "I have yet to find the man [or woman], however vaulted their station, who does not do better work under the spirit of approval than under the spirit of criticism." Meaningful performance development is not only essential for retaining world-class talent, it is also imperative for organizations who are looking to pass on their legacy to the next generation. Download our Re-Engineering Performance Management paper and listen to the accompanying webinar to discover what truly motivates employee performance. Empower employees and teams to discover and develop their strengths using our CliftonStrengths assessment. Inquire about our performance management solutions, ranging from process redesign to manager training to further your performance management strategy.